Running and meditation work together so well that each one improves the other. Meditate while running to create more peaceful and enjoyable runs while improving your running ability and reducing injuries. Running while meditating also improves your ability to stay in the present moment, increases body awareness and calms your mind. 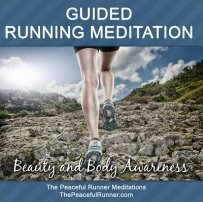 If you struggle with meditative running, our Guided Running Meditation (link below) can help you have more peaceful, enjoyable and injury free runs! Meditative running can link our spiritual and physical presence in a method similar to some of the martial arts.Tai Chi is a meditative Chinese martial art. It combines use of the breath, angled positions and weight shifting in continuous movement to develop a strong awareness of self. It is done outdoors whenever possible to increase awareness with the presence of nature. Originally, the ultimate goal of Tai Chi was to go beyond the physical experience and develop your form, mind and energy flow to become one. Running provides a great opportunity to do meditation. As when practicing Tai Chi, we can focus on our breath and our form as we continuously move forward. It is easier to become aware of our body during running. We can be more easily distracted from our mind as we focus on our muscles and all the sensations we feel as we move. During running, there is an increased flow of blood to the brain. This reduces left brain functions, such as: solving technical problems, calculating numbers and analyzing information. This allows for an increase in right brain functions, such as: feelings, visualizations, intuition and imagination. That is the part of the brain that meditation needs to access. Running presents a unique opportunity to gain access to our intuitive side of the brain. Running and meditation can provide the same benefits as a sitting meditation but it is so much easier to do and saves time. Running and meditation as one activity is certainly a positive example of of multi-tasking. How we deal with pain is often how we deal with life. If we can develop our ability to accept pain and physical discomfort, then we will no longer be afraid of pain. For running, this means your body is more relaxed and has less tension stored in your muscles, ligaments and joints. 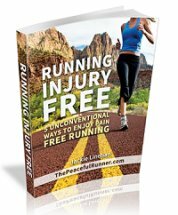 When you overcome the fear of pain, it removes tension in your body -- the tension that keeps you from running easily, efficiently and injury free. With meditative running, your efficiency will improve as you will be running at a higher energy frequency. You will also experience better performances as you will have more control over your thoughts. Running and meditation go great together but as in all forms of meditation, it takes practice to learn this skill. It takes practice to be able to detach from our thoughts but that is the goal of meditation -- to stop our continuous brain chatter and listen. Learn to listen to the silence and create the space that allows your inner voice to be heard. 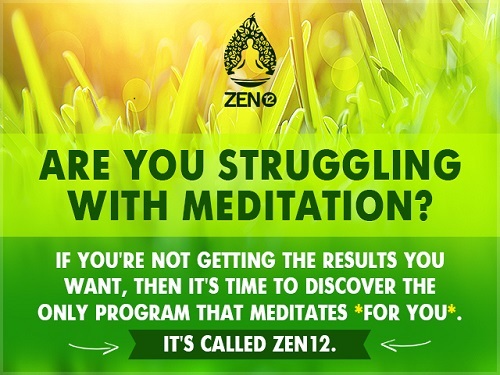 Meditation will take you more deeply into your body where you can access the wisdom of the body. Begin your run as normal and after about five minutes, begin to focus on your breath. You can follow your breath as it enters and leaves your body or you can count your breath as you inhale and exhale if you find that easier, i.e. count to 10 and repeat. Fully concentrate on your breath. If your mind begins to wander, just bring it back to the breath and accept that it is a learning process. Don't get frustrated or get down on yourself. Accept everything as it is and become focused again. Thoughts will always arise. Just become aware of them as an observer and then let them go. You may notice that some thoughts keep repeating themselves. These are probably the ones that have been negatively affecting you and how you run. As you are learning, try to concentrate for short periods of time, rest and try it again. It will take time and patience to learn this skill, but the many benefits you will experience in running and in life will be worth it. As you continue to practice, you will learn to concentrate better and become less attached to your thoughts. While you are focusing on your breath, develop an awareness of everything -- your body as it moves, how your feet feel as they hit the ground, the environment, all sounds -- everything that is present in this moment. Focusing on the present is necessary to let go of all thoughts. When running becomes difficult and you feel tired, accept and focus on your temporary state of tiredness. Accepting it will help you to overcome it. Use this affirmation: This too will pass. If you feel pain during your run, it is a reminder to go back and focus on your breath. Pain can keep you present. 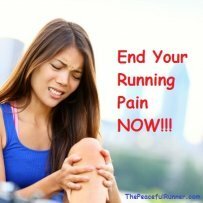 Just as suffering in the world exists to bring us back to conscious awareness, running pain can be used to bring us back to our own awareness and breath. Whenever you experience pain, don't resist it. Accept it to transcend it. Note: Vipassana Meditation is a meditation practice that specifically focuses on overcoming pain and physical discomforts. During your running meditation, feel the overwhelming joy within as you connect to your inner body awareness, strengthening your ability to remain in the present moment. Speed is not important to this practice. It doesn't matter what how fast or slow you run, but it needs to be at a comfortable pace for you to allow you to move consciously keeping your focus on your breath, your body and the present moment. When your meditative run is completed, continue to allow the feelings of peace, contentment and joy fill you and overtake all other emotions for the remainder of the day and maybe even until your next meditative running session. Keep practicing your running and meditation to enhance the joy of running and life -- simultaneously! If you still more help with this skill, try our Guided Running Meditation!